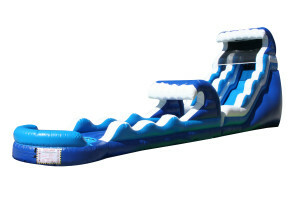 Feel the power of a tsunami with our Tsunami Slip N Dip slide. You'll pick up speed as you start you initial descent down this inflatable slide and cause a mini-tsunami of your own as your body splashes into the pool. Better warn your guests to stay out of the splash zone if they don't want to get wet.